Super Blue Blood Moon. When you hear that term, you might think it sounds like a scary disaster from a video game or movie. However, it was an actual event that recently occurred and was visible to much of North America and the Pacific Islands. But what exactly was this marvel in the sky? Let’s break it down. As the Moon orbits the Earth in about a 29½ day cycle, it goes through various phases. Since 29½ is less than most calendar months, there occasionally will be two Full Moons in one month. The second of these Full Moons is called a Blue Moon. A lunar eclipse occurs when the Moon passes through Earth’s shadow, blocking the sunlight on the Moon. One of the first things a person might notice is the reddish color of the Moon. The red color is caused by the bending of sunlight through Earth’s atmosphere as the Moon enters Earth’s shadow and reflects only the refracted light. On January 31st, 2018, the Moon was at its orbital perigee (Supermoon) at the time of the second Full Moon of the month (Blue Moon). 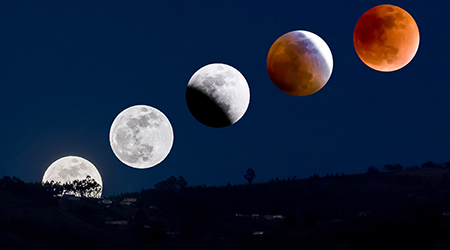 Along with these events, a lunar eclipse occurred causing the Moon to appear in a reddish hue (Blood Moon). And there you have it: a Super Blue Blood Moon. These naturally occurring events are part of the physical laws God put into place when He created the Universe. The calculable behavior of the Universe allows scientists to predict celestial events long before they occur (proving the Universe is not the product of a random accident). The beauty and complexity of such celestial events should fill us with awe toward the Designer of the Universe.